The “intern economy” is a crumbling monument to short-term thinking. The class-action lawsuit filed in 2010 against Fox Searchlight Pictures by former unpaid interns on the film “Black Swan” set off a wave of internship lawsuits that is likely to have lasting consequences for companies with business models that rely on free college-age labor. Fox is appealing the ruling that came down squarely on the side of the interns. Regardless of how the case is resolved, the thousands of dissatisfied plaintiffs who have joined similar suits — including two that recently resulted in multimillion-dollar settlements against Condé Nast and NBCUniversal — reveal that something is broken in how young talent is cultivated. Unfortunately, some businesses — facing shrinking payrolls and a swelling labor market — have exploited young workers desperate to augment a resume. At any one time, 500,000 to 1 million interns are working for free or minimal pay, too often shadowing executives or running errands instead of learning skills. Universities shoulder some of the blame by failing in their oversight role, awarding course credit for internships that weren’t a meaningful step forward in their students’ development. Yet legitimate, well-structured internships remain excellent introductions to a career. Some major employers, like Condé Nast, have eliminated their programs while others are struggling with the economics of paying interns for the first time. Employers should consider an overlooked alternative: Expanding and improving cooperative education, or co-ops. In these programs, businesses and universities acknowledge their mutual goals and work together to create new pathways of career training that benefit all parties, including the many young people who’ve been so poorly served by unpaid internships. As president of Drexel University, I know first-hand that the co-op model works. More than 95 years ago, Drexel created some of the nation’s earliest co-ops, and more than 17,000 employers have participated. Drexel is one of only a few universities in the country that have made co-ops integral to teaching and learning university-wide. Our experience has shown that when employers truly collaborate with higher education, the approach adds considerable value. Cooperative education provides students with sufficient time and intensity to master new skills. In a typical five-year undergraduate degree program at Drexel, a student spends 18 months working full time with as many as three employers. 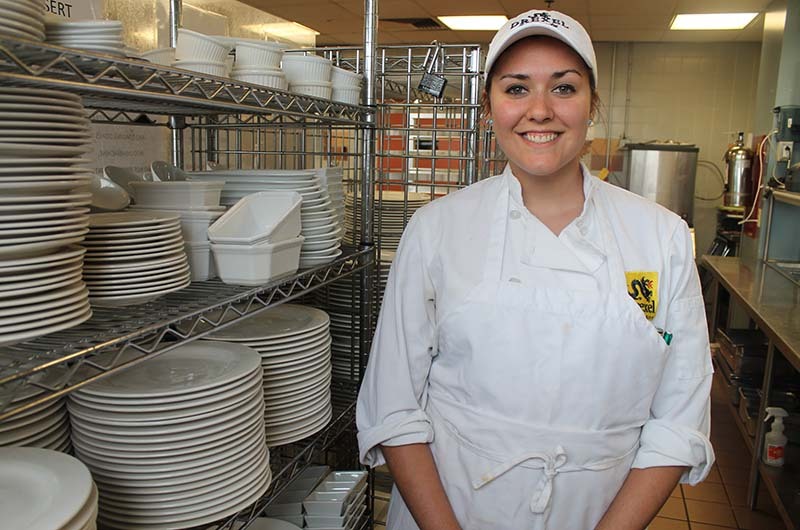 Some students return to the same employer at different stages of their education, legitimately integrating classroom knowledge and workplace application. Building a better career pathway for the 21st century also addresses a primary concern I’ve heard again and again from incoming students and their parents: How can universities ensure that students get a real return on their investment in their education. A remarkable 46% of Drexel graduates entering the employment market receive a job offer from one or more of the companies where they “did co-op,” according to surveys of exiting seniors. Our internal research shows that when hired, they are paid a starting salary that is 19.5% higher than the national average for a newly employed worker with a college degree. 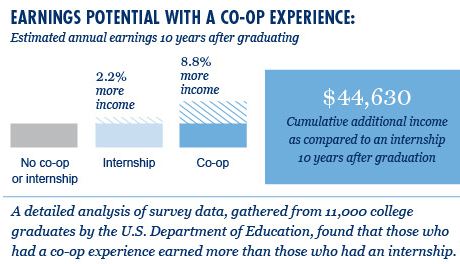 Students at other institutions with co-op programs experience similar results. According to an analysis of data gathered from 11,000 college graduates by the Department of Education, those who had a co-op experience while in college earned about $44,600 more, cumulatively, in the 10 years immediately after graduation. Most Drexel students are paid by their co-op employer — on average, co-op students earn $16,500 over six months. We are aggressively raising funds so that co-op students who aren’t paid by employers receive a stipend. Because the new economy means that many of today’s graduates will be their own boss at some point in their career, our Charles D. Close School of Entrepreneurship pays students stipends of up to $15,000 while they launch a company: Essentially they are their own co-op. Yet employers are the ones who see some of the greatest benefits from cooperative learning. In an era of downsized training and recruitment, many report that a six-month co-op provides a kind of “trial employment,” which explains the high rate of job offers. Expanding the co-op model to more universities and employers won’t be easy. It requires rewiring academic priorities and schedules to accommodate time spent both in and outside the classroom and investing more human capital in managing these student-employer relationships. But the alternative — minor tinkering with a career pipeline that is clearly broken — serves no one. Higher education’s role as a crucible for shaping knowledgeable, inquiring citizens can encompass meaningful career apprenticeship, but only in a spirit of cooperation. John A. Fry is president of Drexel University. This op-ed was first published in the Los Angeles Times and can be viewed at this link.